My child looks like they have flatfeet!….Do I need to do something about this? Have you noticed your child walking with their feet rolled in or do they walk with their feet turned out? When they’re standing does it look like they almost don’t have an arch? Have you looked at their worn school shoes and noticed they wear out the heel on one edge? If you have answered yes to any of these questions they may have flatfeet! Then it is time to get your child’s feet checked! Flatfeet is a common presentation among children till the age of 6. It is not unusual for children within that age group to not have an arch as their feet are still developing. However, if your child has flatfeet and complains of sore feet or legs, then it is recommended to see a Podiatrist. The above mentioned are just a few reasons for flatfeet. It is essential to get your child’s feet checked even if they have not symptoms as research has shown that having flatfeet increases the risks of having knee, hip and lower back problems in the future if not corrected early in life. Most flatfeet conditions can be easily treated with stretching exercises, orthotic therapy and proper footwear. Our thorough screening tool will help us determine the core problem for your child’s flatfeet and tailor a treatment plan for them. Want a little tip to strengthen your child’s arch? 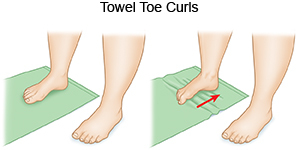 Lay a towel on the ground and put your feet on top of the towel. Try to grasp the towel with your toes. Do this 20 times once a day. This will help strengthen the muscle that holds up the arch of the foot. ← What party heels to wear for your foot type and stay comfortable all night.